What the heck with our weather lately? First, it was all stormy rain followed by snow. Ugh! It's keeping us all indoors trying to stay dry and warm. But being indoors is so tough with a toddler, especially an active toddler that NEEDS to move. In fact, I'm pretty sure Caleb's motto is, "why walk when you can run?!" So I'm constantly trying to come up with indoor things to do that keep my active little boy busy, but also fun for mom and dad. We don't often drive down to the area of the waterfront that runs down by the docks and museums--you know, where Dock Street runs along Thea Foss Waterway on the other side of the 705. If we're hanging out along the waterfront, we're usually along Ruston Way by Commencement Bay. 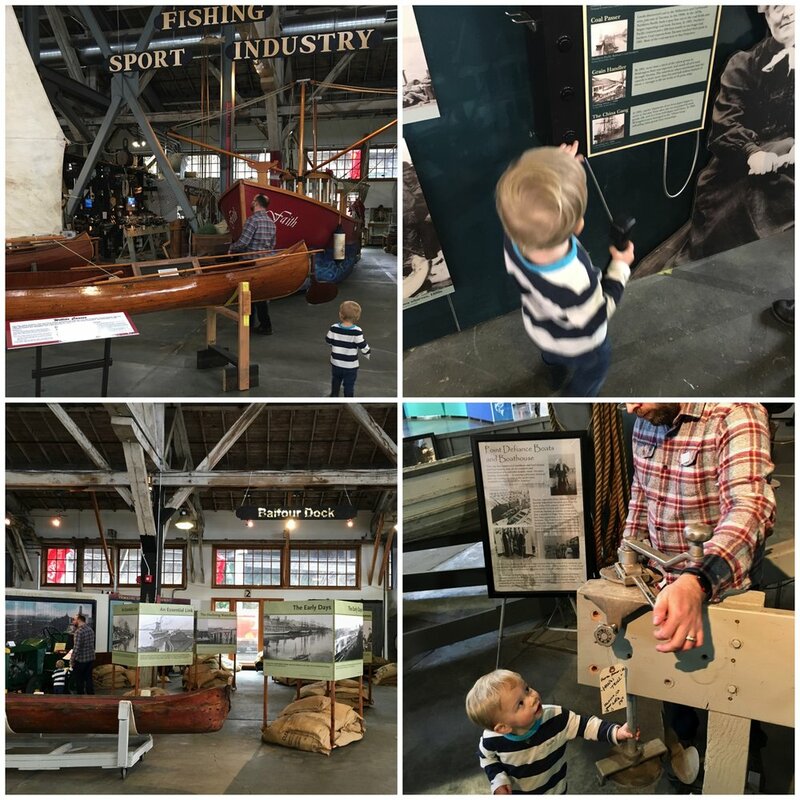 Although on those rare occasions we happen to drive down Dock Street, I see the Foss Waterway Seaport and think how we should check it out and look into whether it is toddler-friendly. Of course, I would forget and we would never actually end up checking it out. Until now! The other day I saw a friend posted a picture of her kids at Foss Waterway Seaport and it looked like it had some things for kids. So when we found ourselves Saturday morning at Anthem Coffee getting some caffeine, watching the pouring rain, and wondering how to spend our morning, I miraculously remembered Foss Waterway Seaport and suggested we check it out. And we did! Have you driven by this place and wondered, too? This is a newer museum to Tacoma. I don't hear many folks talking about it, which now that I've been I find surprising. How come the word hasn't spread? Secretly, I'm glad as it made our visit quite nice as there were barely any other visitors there. We almost had the whole place to ourselves and Caleb could run around without much of an issue. We arrived right around 10 am when it opens on Saturday. Before entering, there was a small break in the rain so we took Caleb down to the docks for a moment. There may be more outside to explore, but with the rain and cold, we kept mostly indoors. When you first walk inside, there are these big jellyfish art pieces hanging from the ceiling which are pretty cool looking. Then a bunch of boats in the main area upfront. But first, we had to pay our admission. Caleb is 2 years old, so he was free. Children 5 years old and under get in for free. Children over 5 years old, students, and seniors are $8, and adults are $10. There are some discounts for AAA and families, which is great. We were $20 for our family. Not terrible. We spend about 1.5 hours there, so we felt it was worth it. Also, parking was easy and free so that's awesome. Before heading into the main museum area, we were pulled (literally) to the train section by Caleb. Trains are his obsession right now. The little train section is really great. They have a model train setup that you can control, a kids train set, and a video of train footage inside a train structure. Even though we have a train table at home, we had to play here for a little while. The model rain they have setup is great. You can turn it on and control it as it goes around the track. It's not big, but it's definitely fun for kids to watch and you can get close up. I think dad enjoyed this, too. There is another model train that is bigger and you can push a button for it to send the train around. Not a huge exhibit, but that didn't seem to bother Caleb. Oh, there is a sign with buttons that make a train noise when you push it. Buttons and noises...you can't go wrong there! Next, we walked over the Balfour Dock section, but this seemed to be mostly the history of the docks and waterfront. While, likely interesting for parents, it is not so much for kids. So we moved on to the Fishing Sports Industry section. This section had some great things for kids to explore. Caleb's favorite was going onboard "Faith," the boat. You can put on a life jacket, spin the helm (boat's wheel), and check out other cool things on the boat. Near the boat, was a pulley system called "Block and Tackle" that allows you to pull on the ropes. Caleb certainly tried pulling with all his might. There were other gadgets and engines that were hands-on and allowed you to explore and investigate...every toddler's dream. Onboard and exploring the boat, "Faith"
We moved on next to an area with model ships, old signage, helms, and other vintage boat artifacts. This got a few "wow"s from Caleb. Some of the items are "please do not touch" but some you can touch. After this area, we crossed over to the other side of the museum. Oh, and the picture with us in the red hats is from the other side but it didn't fit in any other photo collage, but I felt it must be included. There is another little boat to go onboard and they have the hats out to wear. In retrospect, I don't think I'd put the hat on. It was stinky. Ha! And then I got paranoid about lice. So, don't be like me and perhaps skip wearing the hat and just say you did it instead. On the other side of the museum, they were working on woodwork building boats. We caught a few minutes of that in action, but Caleb was off to the exploration area. It even it says it, "Come Explore." 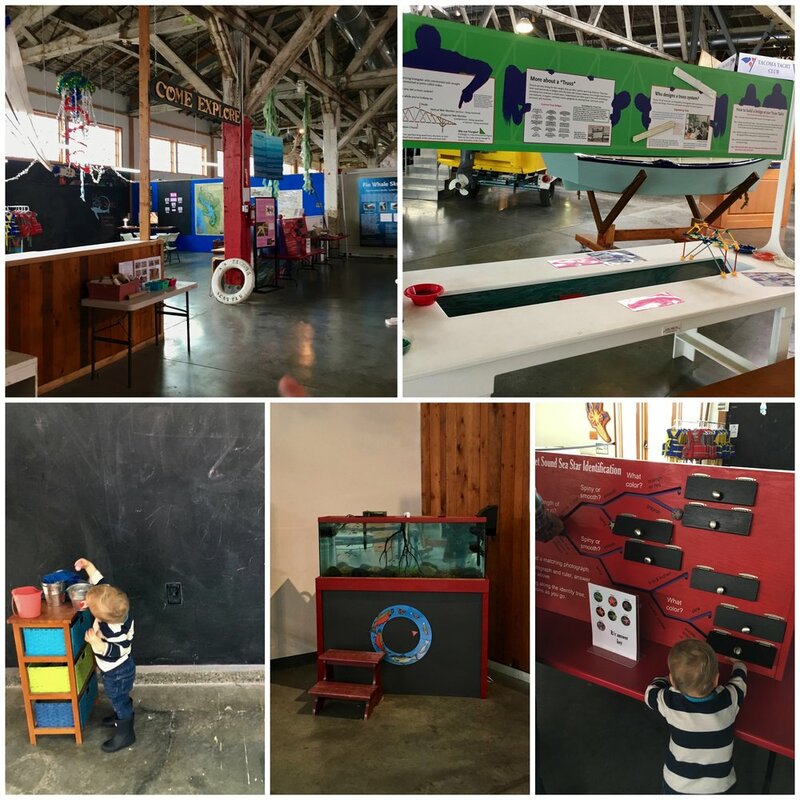 There is a chalkboard, baleen & bones to feel, horns to blow, a fish tank, an identification flip board, and a place to build model trusses (bridges). On the main floor, there were several hands-on activities for kids as well. A table with funny nautical costume hats, a load your canoe (and keep it balanced), and best of all, a lego section to build neat lego boats. I would definitely recommend a visit. We had a great family outing and it was a nice activity indoors during the rain. It's not necessarily a place to go to all the time like the Children's Museum of Tacoma, but it was a great "once in a while" visit. Or, take your out of town guests here, too. I definitely plan on bringing the grandparents when they're in town next. Have you been? What was your experience? Did you go on a nicer day and see if there was more to do outdoors? Let me know in the comments. I love to hear other's experiences.